Could this salad be any cuter? This is the perfect dish to serve for lunch with the girls or a fabulous side salad with dinner. I also love using kale in my salads because it tastes even better the next day after marinating in the dressing overnight. For the dressing, combine all of the ingredients except the oil in a bowl. Gradually whisk in the oil until the mixture is emulsified. Season with salt and pepper to taste. Massage the kale with the dressing and toss with the remaining ingredients. Serve and enjoy! 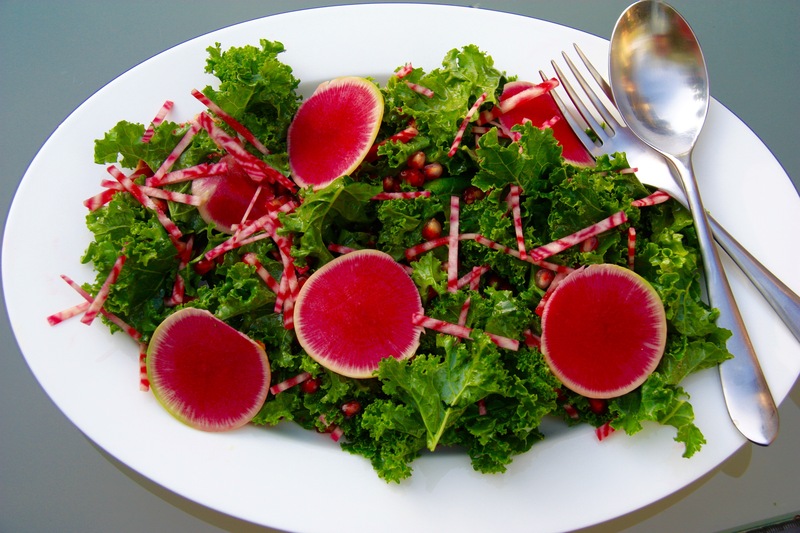 Candy cane beets and watermelon radishes are not always the easiest ingredients to find. If they are not available at your local grocery store, feel free to substitute with a regular red beet and radish. It will still look gorgeous!